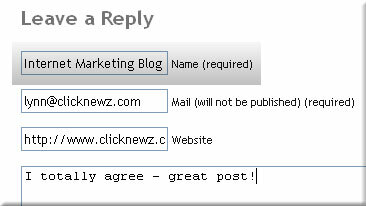 A common link building task is to post blog comments on blogs with the dofollow plugin installed. Since blogs have the NoFollow attribute on links in the comment area by default, linkers search for 'dofollow blogs' to get inbound links that count (that pass PageRank). To be clear, there is no such thing as a "dofollow link". It's simply a link that does not have the NoFollow attribute. For more on that, see the NoFollow Attribute section in the Link Building 101 post. Bloggers don't like this, and often they won't approve your comment if you use a keyword phrase in the Name field. Some have statements to that effect printed on their blog, others simply trash the comments. It's a personal call, and each blogger handles it how they please. As for me, I tolerate to an extent... but only if the comment itself really contributes to the discussion. Otherwise it's a quick delete - and annoying to boot. So your first major hurdle is finding dofollow blogs in your niche, or relevant to the page you want to link. Second is getting keyword rich hyperlinks with your blog comments approved and displayed. A pingback occurs when one blog post links to another. This will happen whether you are linking to your own blog posts (internally), or linking to someone else's blog post on a different domain. It's a great way to interlink related content. Internally, between your own blog posts, interlinking can help your readers find more information from you. They may be reading an older post and click through the pingback to read your newer, related content. Or they may be reading a new post and follow links that reference topics you've discussed in detail already. As you can see, the pingback uses the Post Title of your blog post as the anchor text for the hyperlink. In this case "Link Building 101: What is a Backlink?" is the anchor text, linking back to my post with a bit of the post text as the "comment". Obviously if you are using keyword-rich Post Titles (and you should be! ), this is a better way to get a keyword-rich link from a relevant blog post. And not only does this give you the inbound link you were hoping for, but pingbacks also get a much higher click-through rate (CTR) than blog comments. Readers view pingbacks as add-ons to the discussion, connections to related conversations. Think about it. Which one are you most likely to click on yourself? Note: Not all blogs are set up to display pingbacks, and not all bloggers will approve pingbacks. Pingback spam is like comment spam - rampant. You'll want to locate blogs that display quality pingbacks, and make sure your post is relevant to their post (ie quality content that contributes to the topic). First, you should have a collection of related blogs in your niche in your Feed Reader or bookmarks. While scanning through their blog posts, you want to look for two things: topics you've already blogged about, or new topics that interest you. When you find a great blog post on a topic you have already blogged about, you can go back to your published post and edit it. Include a link to their blog post from yours, click "update post", and this will initiate a pingback to their blog post. You might add a short paragraph that says "also see XYZ by ABC on this topic for a detailed explanation of 123" or something like that. The goal is that it makes sense within your post, to human readers, and that it interlinks the two related posts - from your blog to theirs, and theirs to yours. When you find a new topic in your niche, and you have an opinion to add to that conversation, you can create a blog post in response - instead of leaving a comment. This serves two purposes: it introduces the topic to your own readers, and opens it up for discussion at your blog - and it also creates a pingback, connecting the two blog posts on that topic. I also seek out relevant blog posts to quote as sources within my own blog posts. Once I have a topic in mind, I search for blogs that display pingbacks that are on topic and worth quoting - to add weight to my own thoughts on the topic. I know - it says Trackback instead of Pingback. I am still not quite sure what the difference is between the two. They seem to be very similar if not the same from where I'm sitting. Regardless, it happens by linking to one blog post... from another blog post. See Pingback and Trackback. Also see: What’s A Pingback? And How To Write Links by Sue Waters. The web is made up of conversations, micro-topics and links that connect them. If you're not interlinking relevant content, you're doing a disservice to your readers - and to the web as a whole. Blog commenting is good, but Pingbacks are better. Pingbacks take less of your time, and add quality content to your own blog at the same time. Even better than both are links within the actual content area of a blog post. If you’re spending a lot of time on blog commenting for link building, your time could be better spent doing guest blogging and/or article marketing. Not that blog comments and pingbacks aren't good, because they are... but if you’re counting every minute while trying to grow your online business, do the things that count the most. p.s. I mentioned that Pingbacks get a much higher click-through rate from blog comment sections. And they do. I take 5 minutes when writing a blog post to search out relevant posts to link to and add them in. It provides greater resources and depth for my readers, while also creating that pingback on the linked-to post. Great information Lynn! I finally understand what a pingback is and how it can help. I noticed that you used the word "source" as your link above. I take it that anchor text here isn't as important as in other cases? Do most blogs today use the pingback feature? If not, is there a way to figure out what blogs do or should I even worry about this? Some blog themes display pingbacks, some don't. And some bloggers approve them, some don't. So the key is to find blogs that display and allow them. When you go searching for relevant posts on other blogs, how do you go about that? Just Google the keywords? I'm sure there are programs that do this, but I Google my Primary Keyword Phrase for my blog post, and search out blogs in the results... then click through and look for other pingbacks. Older established posts will usually have them - or not. But when in doubt, if I want to link to a resource that is valuable for my readers, I do it - pingback or not. Such great info! I find that many of the blogs in my niche don't have trackback/pingback which is a bummer. But I like the tip about adding my opinion to someone's blog post by writing a new post on my blog and linking to them. I'm excited to read more about quality of links. This is a great series. You mean they don't display pingbacks, or you just don't see any? It's worth a test to see if maybe they do, but just don't have any to display. You can go back to older posts in your archives and add resourceful links (such as "Related resources around the web" at the end of the post) and then check back to see if the pingbacks appear or not). I've actually had a few trackbacks on my blog, but wasen't too sure whether to treat them as spam or a genuine comment. I now realised what trackbacks really are and how valuble they are to our blogs. I think commenting on DO FOLLOW blogs is also a usefl back link strategy and can bring in traffic and you get good back links all for free. I usually click through the pingbacks and make sure they are quality posts that add to the topic/discussion before approving them. There is as much pingback spam as there is comment spam, so always check them out. Lynn, I've found that "trackback/pingback" SPAM is more prevalent, at least when it comes to people linking back to my site, I guess for all the same reasons you say it's a great way to get links and traffic: It's quick and easy. In fact, I've found many times that the initiating link to my site is gone when I go back to the pinging site. Not sure how that works, other than the website owner is trying to get a cheap one-way backlink (which is what you are getting with a blog comment). When you are going through your current post looking for linking into your prior posts, how do you do that? I mean, you must have hundreds to go through. I can't imagine you scrolling through all of your prior posts to get the link, much less remind you that you already wrote about something. Do you keep a spreadsheet of all your posts and what they're about? A plugin that does it? Voodoo magic? If I can't find it within a few seconds there, I go to Google and type in "clicknewz keyword" (without quotes) and usually find posts I've written that way. When linking to a blog post on another site, is there anything else we need to do to get that pingback? We have link in one of our blog posts to another site that has trackbacks, but it is not showing up. Was just wondering if there was something else we needed to do or if it can take some time to show up. Thanks for your help! The pingbacks are like comments - they often have to be moderated by the other blogger. And sometimes they will approve them, sometimes not. So yes, it can take some time to show up - it's not always instant. I've been learning a lot from you on the internet marketing this week podcast and now on your blog. I do have a question which is do the search engines treat pingbacks like reciprocal link? If so, seems like everyone says that reciprocal links is a waste of time then why bother with pingbacks? A pingback is a very natural instance of a link, and of interlinking related content. Similar to if someone interviews me and links to my site, and then I share the link to the interview with my comments on it at my site. That's also a very natural reciprocal link. Interesting to see how the average length of the comments became bigger. Is that because of Lynns comment about comment quality and deleting the obivious links spam or is it because of haveing more time at weekends? Lynn, I am impressed on the valuze you give away in your linkbuilding series. As I am still sticking to conventional pure HTML sites and not blogs, which probably will change soon due to easier editing, I am glad you described the pingback functionality in detail. [off topic] Also a quick question from the soon to be novice blogger: How do you go and edit comments, is there a kind of 'control panel' listing all comments or do you have to go through each page of your blog seperately? Probably a dumb question, but I couldn't find anything about managing a blog. - Thanks in advance and have a good week. With WordPress you have a very thorough admin panel that includes a section for your comments. You go there to moderate, approve and see new comments. I never edit visitor comments. I'm not sure if you meant edit as in change content, or edit as in approve/delete. At any rate, this is what I use as I often get comments on posts as far as 3 years back, so there's no way I could keep up with them otherwise. I get ping backs emailed to me from posts I have made on other blogs. If I am the person who posted on a blog and it sends a ping back to my blog, is it a good idea to approve a ping back from your own post? Did you mean from your own post, or TO your own post? The answer lies in whether that pingback (link) connects two related pieces of content and adds value to the topic there. If so, by all means - approve it. If it's spam or irrelevant to the conversation on that topic... delete it. Does that help? I guest post on other peoples blogs, and include links to my own blog. I then receive a ping back to approve or delete or disapprove it on my own blog. If I approve it, the Ping back shows as a comment on a post I made on my own blog. I usually delete them because I don't want the comment section to be filled with ping backs...it looks spammy to me. Pingbacks are not spammy - it allows your readers to follow the conversation on to the next blog, where your guest post is. Of course, as blog owner, approving them is your choice. You'll notice I have pingbacks from post to post here, where I reference related posts. I want to use trackback tips for my blog post. But till now I can not understand how to do it actually? Well Lynn can you explain the procedure how to do? You mean Pingbacks as discussed in the post? All you have to do is link to their blog post, from your blog post. A contextual link within the post - that's it. ok, and there after how I will request them for link to my article on their post? The pingback, if approved & displayed on their blog, will happen automatically. No need to request it. If you want to request a link, the best thing to do is a) offer to guest post on their blog on their current topics, or b) ask them to blog their opinion about something on your blog or site. Thank you Lynn, now I understand it. Thank you lots for taking time to respond on my comment. Thsnks Lynn, I was just about to ask what pingbacks were (I'm a newbie)because I have been getting alot of them and wasn't sure what they meant. I thought it was a bad thing, glad to know it's a good thing. As you recommended a few weeks ago, I have begun using the SEO FastStart eBook. An excellent resource; thank you for the recommendation. But, the explanations you have given over the past week have taken that information to the next level. Your series on link building made the subject so clear and down to earth (must be a Tennessee thing). Great stuff...thank you for sharing. Has anyone used Zemanta here? It sounds like a good tool to look at relevnat content, right? I'm not familiar with it. Anyone else? Don't know if I'm supposed to, but I have been dropping the url of the blog I link to in the trackback section on WP. I know it's supposed to pingback to other WP blogs, but I figured it can't hurt! I'm not sure what the effect is, Stephen - I don't see any visible results when I've tested the Trackback field in WP, so I'm not sure. Thanks for the informative post, Lynn and also to Robert for his link regarding targeted blog traffic. I found that commenting on blogs for SEO purposes is very hard and everyday I am trying to find new ways of creating links. I am trying to do these ping back links that I find out reading your article. The ping links are very hard to do too. Any advice on other ways of creating links? Thanks for a great article. But I just wonder, is it enough to link to another blogs post from a post to create a pingback?? As someone who publishes two blogs using WordPress, can I say that I am sick and tired of people coming to my blogs, leaving comments, when they clearly have not even read the post. I have Akismet (possibly the greatest WP plugin ever) but some still get through. It wastes my time and because of that, I just hit delete... and ruthlessly. 1. How to create a pingback. 3. You're of the opinion guest blogging is better than blog commenting. I've done blog commenting and I strive to seriously contribute to the conversation. I don't spam. But, it's a lot of work finding DoFollow comments. I find the packets with lists of dofollow blogs often list blogs that are NoFollow (more likely the result of an influx of spam). Anyway, I'm going to give the pingback method a shot because it's very little effort for a decent pay off. Moreover, and more importantly, on account of your recommendation about guest blogging, I just completed my first guest blog post and it was happily accepted by a high-traffic, PR4 website in my niche. I spent about an hour writing the post. What I learned about guest posting is I know my niches very well, so it wasn't hard to write a unique, high-quality article for a guest blog written from a perspective that the target blog would appreciate. I have three more guest blogging articles in the works and hope to get them published on very high-traffic, high PR blogs. Again, I aim to write the posts from a perspective that best serves the target blog. Anyway, I bought Chris Garrett's guest blogging course on your recommendation and it's excellent (although I'd prefer all the info be available immediately rather than in installments, but the info is fantastic) and through your affiliate link (I always try to buy through an affiliate link when a recommendation proved helpful). I digress here, your post is about pingbacks, which I'm going to give a try. Thanks for the info ... I didn't realize creating a pingback was as simple as linking to a related blog post. Thanks for clearing that up for me, I just happened to stumble across your site and I am glad I did as I have always wondered what the pingback on my blog is all about, now I know I won’t be deleting them, thanks.